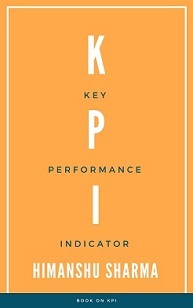 ‘Key performance Indicator’ (or KPI) is a metric which is one of the most important indicators of the current performance level of an individual, department and/or a company in achieving goals. Before you can identify KPIs, you must know your goals as an employee, as a department and as a company. Your goals must align with your company’s core business objectives and you must know how to achieve them (i.e. strategy). Only then you will be in a position to find KPIs which align with your business KPIs. For example, for an individual like SEO, the goal may be, to increase the organic search traffic of his website. But at the organisation level, his goal is most likely to increase customers acquisition and decrease customers acquisition cost through Search Engine Optimization. Similarly, for a department like ‘Customer Support’, their goal may be to solve all customers enquiries within 12 hours. But at the organization level, their goal is is most likely to improve customers satisfaction and retention. Whether you are an individual or a department, your goals must align with your company’s core business objectives. Everyone in the company must be pushing towards the same organization goals. This is the only way to ensure maximum productivity and profitability. Since KPI is a ‘metric’ and a metric can be a number or ratio, we can have KPIs in the form of numbers and ratios. So we can have ‘Number KPIs’ and we can have ‘Ratio KPIs’. KPI is a key metric which has the ability to directly impact the cash flow (revenue, cost) and/or conversions (both macro and micro conversions) in a considerable way. For example if you sell ‘display banner ad space’ on your website and ‘display advertising’ is the main source of revenue for you then ‘pageviews’ can be used as a KPI. The more pageviews you get, the more you can charge for every thousand impressions (CPM) from your advertisers. Similarly, ‘average order value’ can be used as a KPI because it hugely impacts the website sales. You can greatly increase your website sales at the present conversion rate just by increasing the size of your orders (i.e. the ‘average order value’). Every KPI is a metric. But not every metric can be used as a KPI. It is available and measurable. It highly impact its corresponding goal. It is relevant to its corresponding goal. It is available in a timely manner. 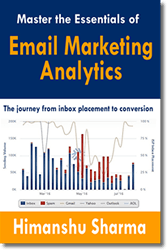 You can use only those metrics as KPIs which are available to you in the first place. For example if ‘Net Promoter Score’ metric is not available to you then you can not use it as a KPI. Similarly if you come up with something which is impossible to measure (like ‘frustration level of customers who abandoned the shopping cart for the 3rd time’) then you can not use it is as a KPI. So when you are finding your KPIs, you need to be 100% sure that there is a mechanism/tool available, to measure and report your KPI in the first place. If a metric does not greatly impact its corresponding goal then it is not a good KPI. If your KPI is highly impacting then it is got to be relevant to its corresponding goal. If your KPI is highly impacting then it is got to be instantly useful i.e. you can quickly take actions on the basis of the insight you get from your KPI. Your KPI should be available to you in a timely manner so that you can take timely decisions. 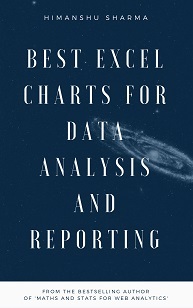 For example, if you are using a compound metric (a metric which is made up of several other metrics) as a KPI and it takes several months to compute it once and then another several months to compute it the second time then it is not a good KPI, as you can not take timely decisions on the basis of such KPI. It is the profit after production and manufacturing cost. Gross Profit = Sales – Direct Cost. It is used to determine the effectiveness of your business in keeping production cost in control. Higher the gross profit margin, more the money is left over for operating expenses and net profit. It is the profit before interest and taxes. Operating Profit = Sales – Operating Cost. Operating cost is the ongoing cost of running a business, product or system. It can include both direct and indirect costs. It is used to determine the effectiveness of your business in keeping operating cost in control. Higher the operating profit margin, more the money is left over for net profit. Also known as net income, net earnings, bottomline. Also known as profit margin, net margin, net profit ratio. It is used to determine the effectiveness of your business in converting sales into profit. Low profit margin indicates higher risk, that a decline in sales will erase the profit and result in net loss. Also known as revenue growth rate. It is the measure of the percentage increase in sales between two time periods. It is the total value added by your product/service/campaigns to the business bottomline. The ‘total economic value’ also take into account the role played by micro conversions and conversions which assisted and completed the sales. It is used to evaluate the efficiency of your investment or to compare the efficiency of different investments. It is used to evaluate the efficiency of investment in an ad campaign. ROAS is different from ROI in the sense that it takes only ad cost into account. Whereas ROI takes total cost into account. It tells how likely it is that your customers will recommend your business to a friend or colleague. More information about Net Promoter Score. It is the projected revenue (repeat business) a customer will generate during his lifetime. Different types of customers have different lifetime value (LTV). One of the best ways to boost LTV is by improving customer satisfaction. Average customer lifespan means how long he/she remains your customer. It is used to determine how good your company is in retaining customers. This score is used to separate profitable customers from unprofitable customers. It is the average cost of generating a lead. It is the average cost of acquiring a customer or generating a conversion. It is the average revenue earned through an acquisition. It is the average value of a visit to your website. 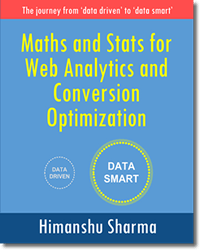 It is the percentage of visits which results in goal conversions. It is the percentage of visits which results in ecommerce transactions. It is the average value of an ecommerce transaction. Through this metric you can measure how effective your upselling and cross selling efforts are and whether you are helping people in finding the product they are looking for. There is virtually no limit to the number of good KPIs you can find and use. It all depends upon the nature of the business and the industry you work in and your goals. For example if you work in an industry where majority/all of the conversions happen offline via phone calls then you can use ‘Phone Calls’ as your KPI. Step-4: Share Core business objectives and corresponding business KPIs across your organization. 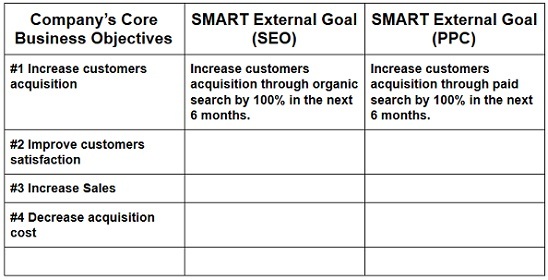 Step-5: Set up SMART External goals for each core business objective. Step-6: Setup strategies and tasks to achieve your external goals. 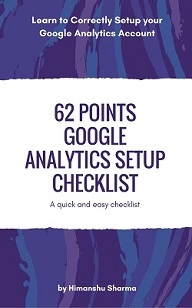 Step-7: Set up External KPIs for each external goal. The core business objectives (also known as macro conversions) are the results you want to achieve, improve or maintain as an organization in the short term and in the long run. Your core business objectives need to be crystal clear before you can find business KPIs. You can find your company’s core business objectives through ‘Key Performance Questions’ (also known as KPQs). KPQs are those business questions which help you in setting up core business objectives. What i am trying to achieve as an organization? What is my company’s mission and vision? What are the short term and long term goals of my company? Founders / top management executives should play a key role in setting up and monitoring their core business objectives. The strategic direction must come from the top. If the captain is not sure to which port his ship should sail then the sailors can’t help him, no matter how good they are as an individual or team. 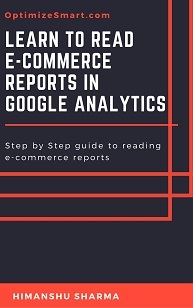 If you are an external consultant/agency then you determine core business objectives with the help of the people who actually run the business and not from the website or Google Analytics reports. Consequently you need to interview your client. Support and maintain company’s core values. Provide excellent customers service etc. #2 Retain existing customers (i.e. Improve customers satisfaction). The core business objectives can vary from industry to industry and from business to business. Thus there are no standard set of core business objectives which should be adopted/copied. Strategies are specific methods you use to achieve your goals. The ‘key performance questions’ can help you in coming with effective strategies. These questions include ‘why’, ‘what’, ‘who’, ‘where’, ‘when’ and ‘how’. ‘Why’ denotes objective and reasoning of your strategy. What you are trying to achieve? What should be the outcome? ‘What’ denotes what is involved in implementing your strategy. Creating and implementing any strategy requires time, cost, people, subject matter expertise and other resources. ‘Who’ is involved in implementing your strategy. These people can be you, your colleagues, boss, clients etc. ‘Where’ denotes the ‘direction’ in which your strategy should move so that you can get highest possible return on your investment. Your strategy should move in the direction where it helps you in achieving your goals in the most efficient manner. Thus ‘where’ can also denote ‘efficiency’. ‘When’ denotes ‘situation’, ‘date and time’, ‘assumptions’, ‘risks’, ‘barriers’, ‘deadlines’, ‘opportunities’ etc. A strategy also need to be time bound in order to be cost effective. Without deadlines there is no urgency. ‘How’ denotes the ‘process’ you will use to execute your strategy. This includes coming up with certain set of tasks. When these tasks are complete, the strategy is considered to be executed. Thus a strategy can be made up of one or several tasks. Without setting up goals and strategies beforehand, you will have hard time coming up with KPIs. A business KPI is a metric which is one of the most important indicators of the current performance level of a business in achieving its core objectives. Customers Growth Rate is the measure of the percentage increase in customers between two time periods. The metric that you choose as a business KPI must highly impact the corresponding core business objective. This is possible only when the metric has the ability to provide recommendation(s) for action which can have a high impact on the business bottomline. In other words, your KPI must have the ability to provide recommendation(s) for action which can highly impact the business bottomline. That is as the value of your KPI increases or decreases there should be corresponding positive or negative impact on the core business objective. For example if you sell ‘display banner ad space’ on your website and ‘display advertising’ is the main source of revenue for your company then ‘pageviews’ can be used as a business KPI. That is as the value of your KPI increases or decreases there should be significant positive or negative impact on the core business objective. Note: Acquisition is also known as ‘conversion’ or ‘customer’. So cost per acquisition (CPA) can be the ‘cost per conversion’ or the average cost of acquiring a customer. The ‘core business objectives’ and their corresponding business KPIs must be shared across your organization so that everyone is aware of what their company is trying to achieve. This will help your employees and departments in setting up goals and KPIs which align with your business KPIs. Do not mess up at this stage (as many businesses do). In many companies employees/managers have hard time understanding how they are adding ‘value’ to the business bottomline and whether what they are currently doing, is really worth the time and investment. And this happen because organization core business objectives and business KPIs are not shared across the organization. And this can happen only when the core business objectives and business KPIs are shared across the organization. SMART stands for ‘Specific’, ‘Measurable’, ‘Attainable’, ‘Relevant’ and ‘Time bound’. Your goal need to be clear and specific. It should target a specific outcome. Your goal need to be measurable. You should be able to measure the progress or regress towards your goal. For example, ‘Customers happiness’ can not be your goal unless you have a mechanism in place through which you can quantify and differentiate between different human emotions (happiness, frustration etc). Your goal need to be realistic. You should be able to achieve your goal within the area of your responsibility and expertise. At the organization level, an ‘attainable’ goal should be based on SWOT (‘strength’, ‘weaknesses’, ‘opportunities’ and ‘threat’) analysis. Your goal must help you in achieving the desired outcome(s). Your goal must have a deadline attached to it. Without deadlines no goal in unachievable. You can achieve it next week, next month or next year. ‘Time bound’ goals bring urgency and help you in staying focused and motivated. 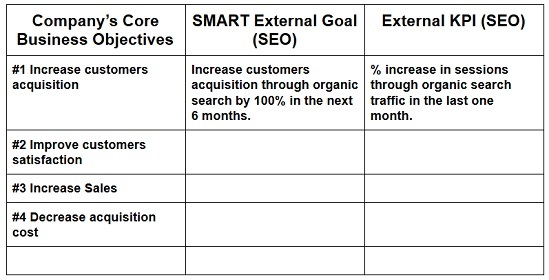 Example of SMART goal – increase organic search traffic of the website by 100% in the next 6 months. External goals are those core business objectives which you can achieve within the area of your responsibility and expertise. External goals are department/function specific. For example, if you work as a SEO, your external goal is to increase customers acquisition and decrease customers acquisition cost through ‘Search Engine Optimization’. 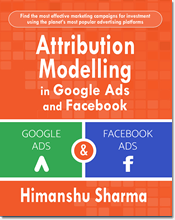 Similarly, if you manage PPC campaigns then your external goal is to increase customers acquisition and decrease customers acquisition cost through ‘Paid Search Optimization’. Whatever you choose as an external goal, make sure that it is always directly tied to achieving company’s core business objectives. Use Key Performance Questions (KPQs) to set up external goals. How can we increase customers acquisition? Can we acquire two times more customers than the last year? Is that realistically possible? If it is possible then what do we need to change/adopt in order to achieve this goal? Why doubling the rate of acquiring customers is important to the business? How this would impact sales and profitability from organic search? Who would be responsible for increasing customers acquisition through SEO? How the success would look like? What should be the time frame for achieving this goal? Your ‘key performance questions must help you in setting up SMART goals. Note: Business owners/senior most management along with department heads must be involved in setting up and approving SMART external goals. These questions include ‘why’, ‘what’, ‘who’, ‘where’, ‘when’ and ‘how’ (as explained earlier). An External KPI is one of the most important indicators of the current performance level of team /department in achieving external goals. An external KPI is also known as department/function/team specific KPI. External KPIs are tied to external goals and are used to determine how you or your team/department are performing, in achieving core business objectives. These are the KPIs we generally report to clients/senior management. External KPIs should be highly business bottomline impacting. Whenever we talk about KPIs in general, we are referring to external KPIs. The metric you choose as an External KPI must highly impact the corresponding external goal. This is possible only when your chosen KPI has the ability to provide recommendation(s) for action which can highly impact your external goal. As the value of your external KPI increases or decreases there should be corresponding positive or negative impact on the external goal and this impact should be significant. For example if one of your external goal is to improve website sales then you can use ‘Average Order Value’ as an external KPI because it can highly impacts the website sales. You can greatly increase website sales at the present conversion rate just by increasing the size of the orders. Note: Business owners/senior most management along with department heads must be involved in setting up and approving external KPIs. The external goals and their corresponding external KPIs must be shared across your team / department so that everyone is aware of what their team / department is trying to achieve. This will help the individuals within your team / department in setting up goals and KPIs which align with external KPIs. Everyone in the team / department must be pushing towards the same team / department goals. And this can happen only when the external goals and their corresponding KPIs are shared across the team / department. Internal goals (also called micro conversions) are directly tied to achieving optimization objectives and may or may not be directly tied to core business objectives. If you are running a SEO campaign, your internal goal may be to improve the quality of your outreach emails so that you can earn more highly quality backlinks for your website. Which in turn can increase the organic search traffic on your website. If you work as a SEO then improving the quality of your outreach emails can not be your external goal. This is because improving the quality of email outreach can never really be a core objective of any business (unless that’s all they do). Use Key Performance Questions to set up SMART internal goals. An Internal KPI is one of the most important indicators of the current performance level of an individual in achieving internal goals. 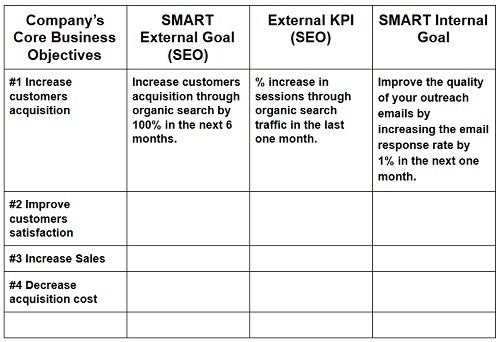 Internal KPIs are tied to internal goals and are used to measure optimization efforts. They may or may not be directly tied to core business objectives. These KPIs are internally used by team members to measure and optimize their marketing campaigns’ performance. They are not always reported to clients/boss/senior management. Internal KPIs do not need to be business bottomline impacting either. Often marketers make this terrible mistake of reporting internal KPIs to clients/senior management. For example ‘Bounce Rate’ is a good Internal KPI for optimizing landing pages. But it is not something which you will report to a CEO. We report only highly business bottomline impacting KPIs to senior management. The metric you choose as an Internal KPI must highly impact the corresponding internal goal. This is possible only when your chosen KPI has the ability to provide recommendation(s) for action which can highly impact your internal goal. As the value of your internal KPI increases or decreases there should be corresponding positive or negative impact on the internal goal and this impact should be significant. For example if one of your internal goal is to improve the quality of your outreach emails, you can then choose ‘Response rate’ as an internal KPI. Note: External KPIs can also be used as internal KPIs. There is no hard and fast rule here. Each employee/team/department need to have both external and internal goals and there needs to be an alignment between their goals. Only then they will be in a position to achieve the core business objectives within the area of their responsibility and expertise and that too in the most efficient manner. Let us look at the internal and external goals of a SEO guy. 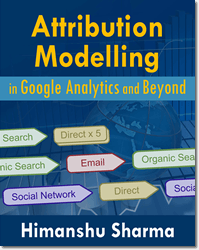 External goal – Increase customers acquisition and decrease customers acquisition cost through ‘Search Engine Optimization. Now once the SEO improved the quality of his outreach emails, he can earn more highly quality backlinks for his website. Which in turn can increase the organic search traffic of his website and which in turn can increase customers acquisition and decrease customers acquisition cost through ‘Search Engine Optimization. Thus there is a clear alignment between the SEO’s external and internal goals. 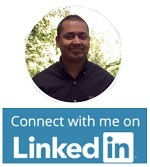 Our SEO guy knows exactly how his day to day work activities impact the business bottomline. Unfortunately this is not the case with many companies where employees/managers have hard time understanding how they are adding ‘value’ to the business bottomline and whether what they are currently doing, is really worth the time and investment. By aligning/re-aligning your external and internal goals on a daily/weekly basis, you and your team can stay focused and productive and achieve the organizational goals (core business objectives) in the most effective manner. 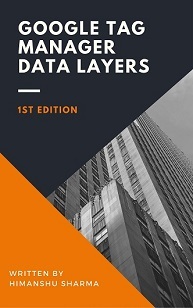 But all of this can happen only when you share: Core business objectives, Business KPIs, External goals and External KPIs across your organization. So this type of sharing and openness is very important. Before you can set up KPIs for yourself, you need to know your team/department KPIs. Before you can set up KPIs for your team/department, you need to know the business KPIs. Before you can set up business KPIs, you need to know your core business objectives. The strategic direction need to come from the top management. If the captain (aka your CEO) is not sure to which port his ship (aka company) should sail then the sailors (aka employees) can’t help him, no matter how good they are as an individual or team.